Thanks to the Black Breastfeeding Blog for pointing out this photography exhibit that pictures contemporary mothers & babies replicating famous breastfeeding paintings. See the Black Breastfeeding Blog for another sample comparison. That is simply beautiful. And what a great idea, too. Wow, I just followed the link. Those pictures are gorgeous. I'd love to see the originals, too, but I probably have to do some sleuthing to go find them. Thanks for the link. Love this example you found! I adore this idea, don't you? I'm going to add a link to this post from my blog. those are so beautiful. thanks for sharing. What a great idea! They are beautiful photos. those pictures are wonderful. Thank you so much for sharing!! so weird that we consider breastfeeding art something acceptable, but when it happens in real life, it's somehow repulsive. This is really, really nice. I second SageFemme--if its all blurry and olden timey, it somehow gives folks the nostalgic warm-fuzzies...but at the mall, not so much, huh? I would like to see a beautiful portrait like this above each bench in the mall and park and store. Not a "nursing station", but just a bench, with some art. Casual. Not in the pit or the corner. In our lifetimes???? Maybe through oil paitings, we can slowly accustom people to re-remember what its all about. Especially the types of people who do jacked up stuff like protest Mothering magazine covers that show gasp! 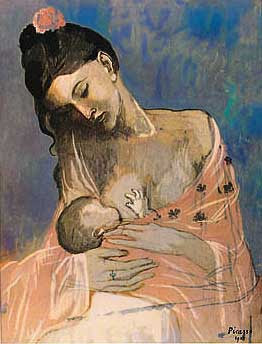 a breastfeeding baby. 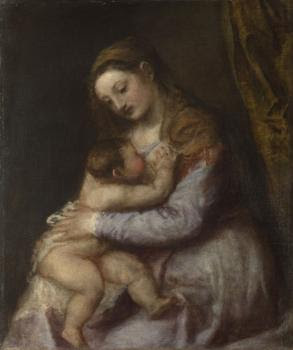 I also love how in the old paintings, it isnt a newborn, but an awesomely plump child who looks about 2 years old. BIG GRIN!!! Yeah, love those nursing toddlers. I betcha they could "ask" for it, too! La Leche League its name! I just noticed this old post because I was scrolling through to read your birth story again! How funny, considering I recently posted similar pictures. but yours are way better!!! I love these Jesus as a toddler ones.